These things are processes. They take time, a lot of time. Given that, I keep coming back to what might otherwise seem an absurd idea. The best-case scenario for all of us just might be a global crash, one that would make 2008 blush. At least then it might afford the world the benefit of unambiguousness. We almost got there ten years ago before it was interrupted by “give ‘em another chance to figure this out”; “them” being Economists and central bankers. The US$ shortage has been a theme around here for most of 2013.  To this point, it has been largely hidden in the shadows and vagaries of modern global finance, only hinted at through secondary and tertiary indications. Even then, like the gold selloff, the dollar shortage was ambiguous and cunning. From repo warnings and the dire state of collateral availability, to emerging market currencies it has been slowly building. Replace “2013” with “2018”, would it be any less appropriate for today? 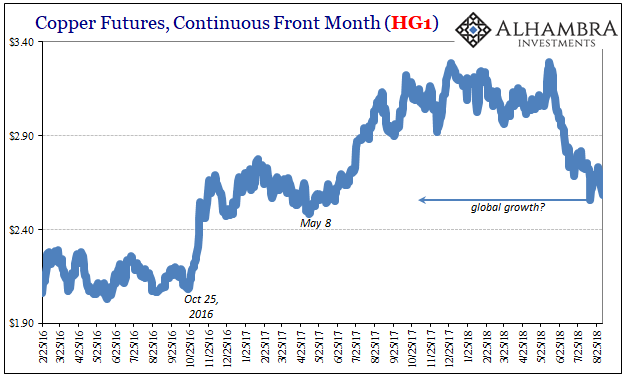 What would eventually come out of that prior episode was the 2015-16 global downturn, the devastating “rising dollar.” It’s deflation, only not all at once. It comes at us in fits and starts, which compounds the problem. Every single time it gives way to reflation, all is lost. The urgency which had been building toward some real truth seeking just disappears as the recovery fairy tale gets reimposed. Human nature is our own worst enemy. Inertia is, without the benefit of perfect clarity, oftentimes insurmountable. It was that way in 2013, too, as I was trying to point out. Underneath the forecasts for great things was an entire menu of not-so-great suggestions. That it took another year to more completely develop tells us something of this divorce. The “rising dollar” may not have broken out until the middle of 2014, but it was there all along – if you wanted to see it. One of the major hints at eurodollar problems was unwittingly provided by India. 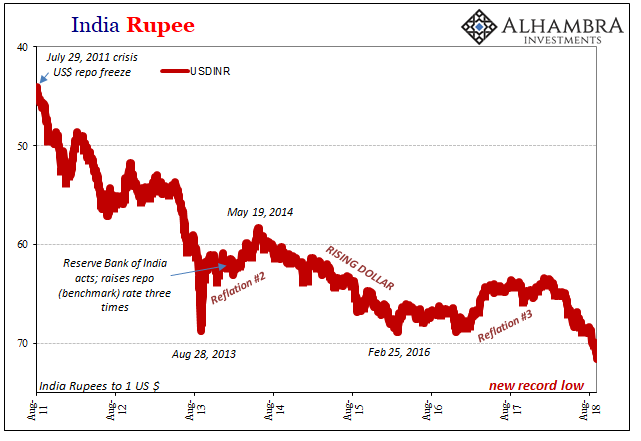 The rupee had crumbled as the whole eurodollar system reversed back in 2011. But in 2013 people began to notice. It took on a new dimension as this “unexpected” “devaluation” stood in stark contrast to the idea of global growth (it wasn’t yet to be synchronized back then). If the world economy was picking up toward what was then expected to be the final closeout of the Great “Recession”, what was happening on the subcontinent? 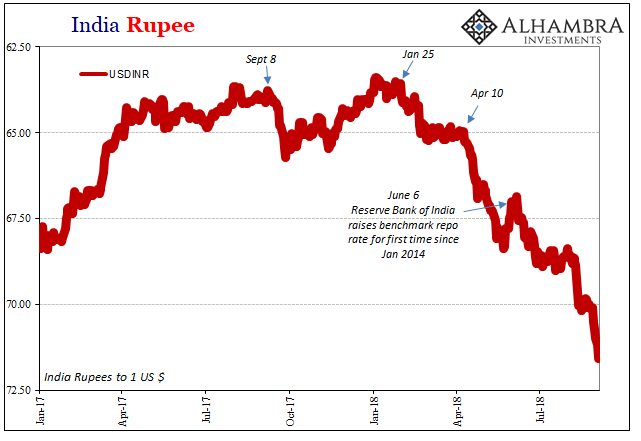 The rupee just didn’t make sense, so it was reduced, as always, to India being India. It’s easy to write off these signals as something other than straight deflation out of pure, irrational conceit. How dare the rupee spoil Ben Bernanke’s party! Must be taper tantrum, then. Or QT. 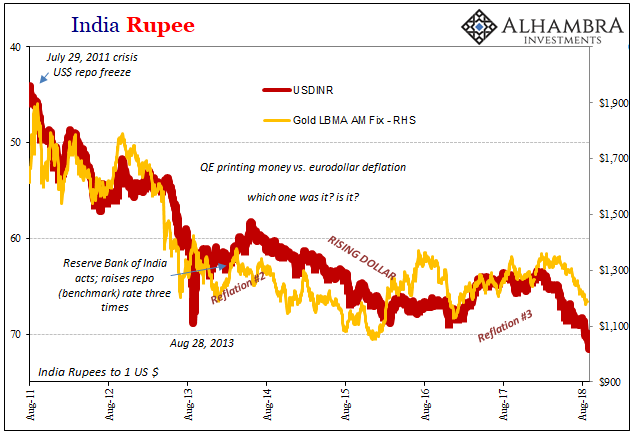 But the rupee wasn’t some outlier. It proved instead to be one of the more forthright canaries. Out of all EM’s, the Indian economy isn’t some obvious basket case. If it happens to this currency, it must be worth looking a little deeper than the Fed feeding a narrative. There was no possible way it could have been a dollar shortage so close in relationship to QE3 and QE4. Both were at that time ongoing at full blast. The Federal Reserve was “printing” tons of “money”, so deflation just wasn’t an option to consider. Not in dollars, anyway. Today is one of those days that remind me a lot of 2013. Copper is down big again and is sitting right at its most recent low, threatening to move substantially lower still. Gold, sinking back below $1200 after a very short reprieve, during the first half of 2018 isn’t down anywhere near as much as it was during the first half of 2013 – if only because it never really came back. 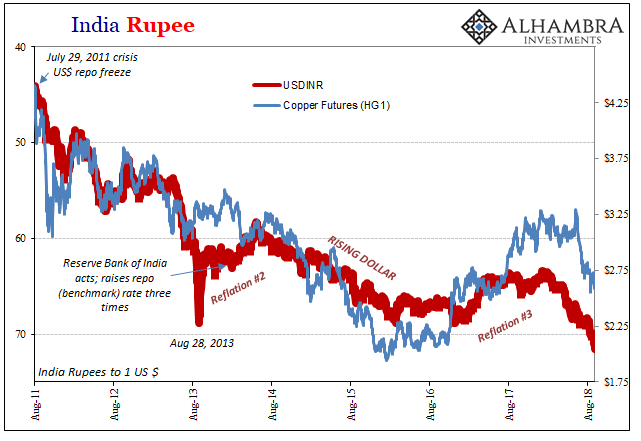 The rupee is careening toward the abyss, setting yet another record India would prefer was actually the benign byproduct of happier times just over the horizon. Bring on the crash because that would at least be something. This economic hell is going nowhere and spending eternity to get there, and nobody having the slightest idea that’s where we are. Like Janet Yellen in 2014, Jay Powell in 2018 gets to begin his tenure with an economic boom monetarily inconsistent with what’s more importantly underneath. This is not to express pity for any of them, quite the contrary. It’s the job to know a little something about the dollar. Central bank confusion is everything about why we are stuck here in economic limbo. The forecast is for accelerating global growth. I predict instead only confusion, which is a huge waste because we’ve seen it all before. Thus, it’s not really mystery so much as self-imposed blindness. Until something actually changes about that, up to and including an actual reset, we’re likely to see it all again if just a little further down this same dark and dangerous road.